Apollo 1 disaster investigation. 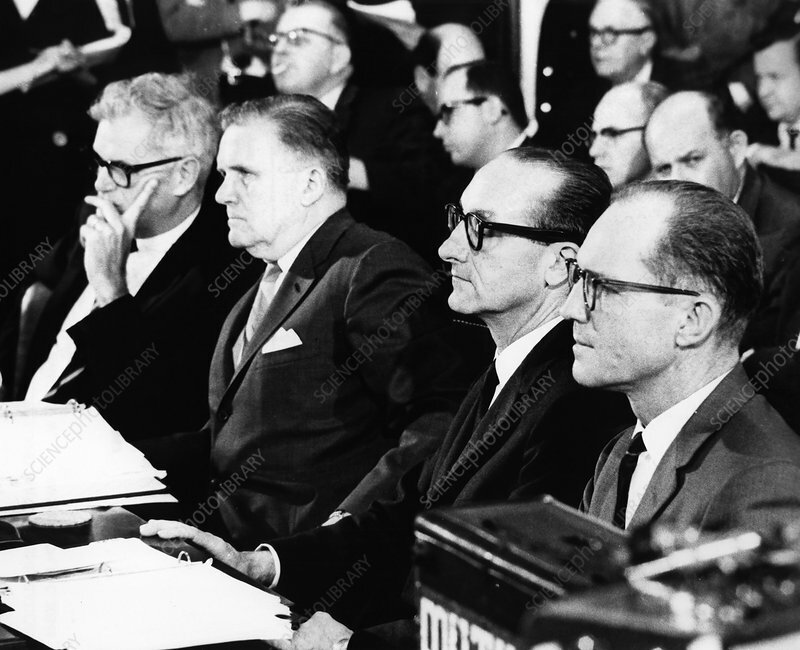 NASA Deputy Administrator Robert Seamans (1918-2008), NASA Administrator James E. Webb (1906-1992), Associate Administrator for Manned Space Flight George E. Mueller (1918-2015) and Apollo Program Director Samuel C. Phillips (1921-1990) seated before the Senate Committee on Aeronautical and Space Services during a investigation into the Apollo 1 mission. The Apollo 1 mission (originally Apollo/Saturn 204) resulted in disaster on January 27th 1967 when a fire broke out in the command module during a launch pad test in which all three of the primary crew died. An investigative board was set up to identify the cause of the fire. The final report gave detailed suggestions for major design and engineering modifications, revisions to test planning, manufacturing procedures and quality control. With these adjustments, the Apollo program became safer and successfully sent astronauts to the Moon. Photographed on 9th May 1967.